of a Lawn Tennis Club in Kings Park. The opening ceremony was conducted by Provost Gavin who entertained those gathered for this event in rather “dreich weather”, by referring to a cartoon he had seen in the previous day's paper of a tennis player surveying a dripping net and saying,- "It's a toss whether I go off to London and the sunny south or whether I take you down and go off and do a little trawling" to which his audience laughed. they in Stirling were so proud" . were then played by players representing lawn tennis clubs in Edinburgh and Glasgow. By this time in the afternoon the weather had improved and although the courts were "heavy" they apparently "stood the test well." The exhibition tournament consisted of mixed doubles, men's doubles and ladies doubles matches on the four new courts. Seating was provided for many of the large group of spectators, others stood to watch this event and refreshments were provided. These tennis courts appear to have been constructed in Kings Park the previous year, but too late for commencement of the playing season. 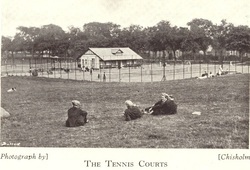 A Pavilion had also been built facing the tennis courts which at the time of this ceremony was expected to open in a few weeks time. This Pavilion was said to be a "commodious structure" and contained a central club room, ladies and gent's changing rooms, lavatories and a kitchen with two stoves which could be used to serve teas. It was unusual in having spacious verandas on both sides.. The reason for having a double veranda design at the time seems to have been that one side faced the tennis courts and the other the putting green on the other side, which had been created in the Park two years previously. The idea was to provide seating for spectators and those waiting to play. Additional seating was also available through the park keeper, particularly when tennis matches or competitions were taking place. Courtesy of Stirling Council Archives and by kind permission of the Stirling Observer. Top picture taken from 'Stirling Official Guide' (1939) Ed. J. Burrow & Co. Ltd Publishers, image courtesy of Stirling Council Libraries.